Houses align the city of Arles in France, Europe separated by narrow pedestrian streets. Overlooking the city of Arles from a tower in Les Arenes in France, Europe you see rows of buildings and houses amongst many very narrow lane ways. This ancient city of Arles, France established by the Greeks in the early 6th century BC is glowing with historic knowledge and you will find the famous Rhone River that forks in to two branches just upstream from the city.Arles, France remained economically important for years as the Rhone was a major port of the city. The famous painter Vincent van Gogh created a majority of his artwork in Arles, France until his mental health deteriorated and his masterpieces became far too strange.Arles, France is a city of ancient Roman times where important remains are still around for tourists to explore. Many tourists visit Arles, France on a yearly basis and are intrigued by all of the Roman history that still surrounds this city.City of Arles and Rhone River seen from a tower in Les Arenes, a Bullfighting arena, Bouches du Rhone, Provence, France, Europe. 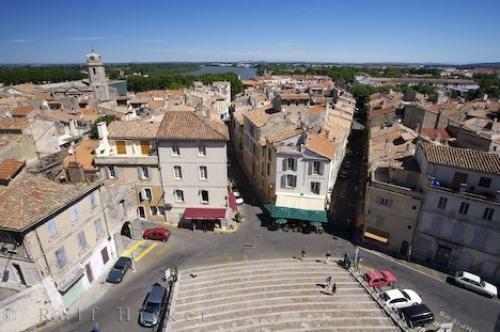 Photo of the city of Arles, France in Europe with the Rhone River in the backdrop.